[In the early spring of 1887, H.P.B., while at Ostende, became gravely ill. With her kidneys badly infected, she was unconscious for hours at a time. 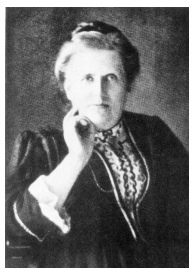 Countess C. Wachtmeister, who was living with H.P.B. at the time, summoned Mrs. Marie Gebhard from Elberfeld and Doctor Ashton Ellis of the London Lodge. A consultation between the latter and H.P.B.’s attending Belgian physician revealed very little hope of recovery. It was decided that H.P.B. would make her Will and that it would be signed in the presence of the two doctors, a lawyer, and the American consul. Before this plan could be carried out, and apparently during the night following upon this decision, H.P.B. was restored to relative health by her Master who had come that night and healed her. She had been given a choice between dying and living to finish The Secret Doctrine. She was shown the difficulties and sufferings she would have to go through in England where she was supposed to go. She chose to remain at her post and continue her work. The next day, the Will was made and signed as planned. For a while, this Will must have been in the hands of H.P.B.’s lawyer at Ostende. After H.P.B.’s passing, May 8,1891, Countess C. Wachtmeister saw the lawyer and was told that at one time he had given the Will back to H.P.B. She must have destroyed it at the time, as it was never found among her papers. Another Will drawn up later took its place (Vide C. Wachtmeister, Reminiscences, PP. 71-75). 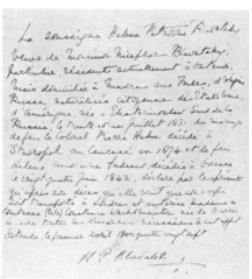 La soussigné Helena Petrovna Blavatsky, veuve de Monsieur Nicephor Blavatsky, particulier, résident actuellement à Ostende, mais domiciliée à Madras aux Indes, d’origine Russe naturalisée citoyenne des États Unies d’Amérique, née à Ekaterinoslav Sud de la Russie, le trente-et-un Juillet 1831 du mariage de feu le Colonel Pierre Hahn décédé à Stavropol au Caucase en 1874 et de feu Helene Andrevna Fadeew, décédée à Odessa le vingt-quatre Juin 1842, déclare par les présents qu’après son déces qu’elle veut que son corps soit transporté à Londre et autorise Madame la Comtesse (Wa) Constance Wachtmeister née de Bourbel à faire toutes les démarches nécessaires à cet effet. Ostende, le premier avril 1800 quatre vingt sept. Courtesy of Axel Fredenholm, Gothenburg, Sweden. deceased at Odessa, the twenty-fourth of June, 1842, declares by these presents that she wishes her body to be taken, after her death, to London, and authorizes Madame the Countess (Wa) Constance Wachtmeister, born de Bourbel, to make all the necessary arrangements to this effect. Ostende, the first of April, 1800 and eighty seven. (1792-1871), British geologist and one of the Founders of the Royal Geographical Society, who went on an extensive geological expedition to Russia. She spoke five foreign languages and was an excellent painter. Her valuable herbarium was presented after her death to the University of St. Petersburg.